With all of the available choices out there, we can help you find the best boat cover for your needs. Finding the perfect boat cover can be a confusing process. You know you need something strong enough to withstand significant environmental stressors, whether those may be snow, rain or intense sunlight. There are a lot of manufacturers out there. You’ll find significant differences in price, features offered, and warranties given. So how do you find the best boat cover? 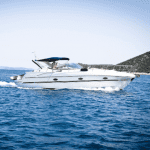 Consider these 6 factors to find your high end boat cover. 1. Fit. You need a cover that’s going to fit your boat. Sure, less expensive covers are available, but, if you can get a cover that’s going to provide a glove-like fit at a great price, why wouldn’t you? Our covers are applied based on your boat, so you can be reassured that you’ll get the best possible fit. 2. Travel. If you’re going to trailer your boat with the cover on, be sure that you have chosen a cover that’s rated for trailering. CoversDirect® offers trailerable boat cover materials, including Sunbrella, Poly-Guard, TravelTuff, and Sun-DURA. Each of these covers are constructed of superior woven fabric that’s tested strong enough for trailering at intense speeds. We include a tie down kit with each purchase, so there’s no need to buy anything additional in order to use your trailerable boat cover. 3. Material. If you’re looking for a highly water repellent cover, you need a material that’s constructed to be water repellent. Sharkskin, Poly-Guard, and Sun-DURA are our best available choices. Many of our customers are in search of a waterproof cover. That isn’t best, simply because those covers don’t breathe. Put your boat up wet, and you have a mess on your hands. Keep that from happening with a highly water repellent, breathable cover. If you’re looking for the best sun protection and most longevity in an intense sun environment, go with Sunbrella. Not only is this material endorsed by the American Cancer Society for sun protection, it provides excellent resistance to fading. 4. Construction. Look for covers with double stitch construction for added strength and durability. Tie down loops should be double reinforced in order to withstand the stresses of trailering. You wouldn’t want to see any raw edges on your cover—join seams should be folded four-ply. Make sure the thread used is anti-wick for superior weather resistance. 5. Look for in stock messages. At CoversDirect®, we warehouse 1,000s of SKUS. We ship each in stock item the same day it’s ordered, as long as the order is received by 3 pm eastern time. If your cover isn’t in stock, we can have it made and headed your way in less than 5 business days. 6. Warranty. Warranties on our site range from 1-10 years. This is the least important piece of your cover decision making process. While that may come as a surprise, it’s true simply because, if you have a high end cover like the ones that we sell, 98% of the time you’ll have no need to exercise your warranty. Your cover will just perform the way it’s supposed to in the years after your purchase. Finally, service is a key component of any purchase decision. Before placing your order, give the website of your choice a call just to see if you can easily get in touch with a person. At CoversDirect®, we staff our office from 9-5 eastern time, Monday through Friday. Whether you’re calling about a sales related issue, or need assistance after a purchase, we’re here to help. Many of our competitors conduct business using automated prompts, which makes it challenging to speak with someone able to provide assistance. We believe that having customer service representatives available to help customers immediately and directly adds additional value to your purchase.